This carving is hand carved from basswood and fully detailed by burning pen. Both bird and base are finished with acrylic paints. The feet are made from bronze and eyes are made from glass. The bird is life size. 4 3/4" 5" 1 1/2. A--from the top of the carving to the base. B--from the beak to the end of tail. C--the widest part of the bird. The finest world class wildlife wood carvings offered by Hummingbird Wood Carving Studio are ORIGINAL DESIGNS. Over the past ten years, Hummingbird Studio has supplied the hand carvings for collectors of. I will continually provide the high quality, genuine and diversified new designs to satisfy my honorable collectors. I will make sure you could experience the MAGNIFICENT PROFESSIONAL carvings from my studio. At the same time, the communication of the art is also welcome. Please visit my store for more world class wildlife wood carvings featuring your favorite. Let me help you with any defective item. Enjoy your visit and good luck! The item "House Sparrow Original Wood Carving" is in sale since Friday, June 28, 2013. 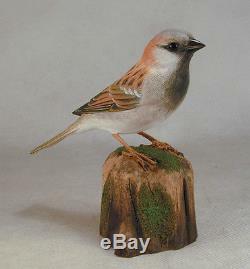 This item is in the category "Collectibles\Animals\Birds\Other Bird Collectibles". The seller is "yaoqiangli1956" and is located in China. This item can be shipped worldwide.